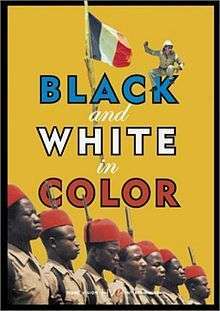 Black and White in Color (French: La Victoire en chantant, then Noirs et Blancs en couleur for the 1977 re-issue) is a 1976 war film and black comedy directed by Jean-Jacques Annaud in his directorial debut. It depicts French colonists at war with the Germans in West Africa during World War I, and is set in one of the then German colonies; either Togoland or Kamerun. The film adopts a strong antimilitaristic point of view, and is noteworthy for ridiculing the French side even more harshly than their German counterparts. The original French title is the first four words (the first line) of the song Le Chant du départ, a French military song. It won the 1976 Academy Award for Best Foreign Language Film; it was submitted to the Academy by Côte d'Ivoire, resulting in that country's first and only Oscar.